This idea gives you a great way of cleaning out your closet and raising some funds during the Prom and Homecoming season. How many people do you know with old prom dresses and bridesmaid dresses that they no longer have any need for? To build up interest in the event, get flyers up around schools, churches and other suitable locations in the neighborhood. Ask for donations of evening gowns that are no longer needed and make sure you specify a drop-off point and contact number. The bridal shops and fashion boutiques in your area may also be willing to donate some dresses for a worthy cause. You can be as flexible as you like though Saturday morning is the ideal time for this kind of event. 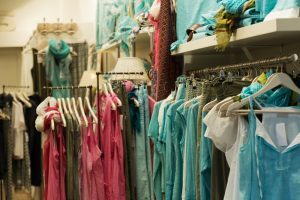 Use a large room (think gym or cafeteria) so there's plenty of space for viewing the clothes you've collected, and make sure there are full-length mirrors available should people want to try the gowns on. For extra interest you could ask hairstylists or make-up artists to donate their time — people attending the event could then pay a donation for the full makeover experience. Set prices between $20-50 and you can make a significant amount of money. Refreshments can help keep people lively and interested in your event, so have coffee, bagels, donuts, bottled water and anything else you think is suitable on hand. You can find more information on holding a clothing consignment fundraiser here.